“Is plastic okay?” asks the bagger, tersely. The world assumes I’m being rude. At least, that’s what it feels like. But, dear cashier/bagger/receptionist/waiter/clown, I am not ignoring you. I’m deaf. I loathe being thought of as rude. Even if I know I’ve not done anything wrong and it’s just a wrong assumption on your part, I can’t stand the thought of being rude. And in addition to that, your looks of judgement and disdain generally sour my mood in an instant. I’m sure I’m not the only one. I know there are plenty of people that honestly don’t care, but I’m sure there are also others like me that do care. Perhaps we shouldn’t care about how we’re perceived, but we do sometimes. 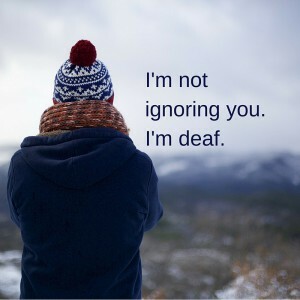 Why can’t you assume I am deaf and not ignoring you? It’s not just about being perceived as rude, either. Sometimes it’s a more dangerous situation. A number of years ago, my wife was getting her new classroom set up, and I was helping her out for the day. I was carrying boxes back and forth from the car to her classroom. It was a hot Saturday, and the school was locked up for the day. As a teacher, she was obviously allowed to be there, getting her room ready for the new school year. Well, on this day I was trudging across the lawn with a heavy box, trying to keep it from falling apart. I sensed something, my Spidey senses tingling, and I looked behind me. 15 feet away, about 6 police officers were walking toward me, hands poised on guns, the lead officer red-faced and yelling at me. They thought I was ignoring them. Their response was therefore angry, aggressive, and in my opinion an overreaction. I had a box in my hands, and I was walking slowly. What did they think I was going to do? The situation was defused when my wife came out and set them straight. Personally I was still a bit shook up by the encounter. A gun makes me uneasy when someone’s hand is resting on it, ready to draw. Why can’t they assume that I am deaf and not ignoring them? This post isn’t to make anyone feel bad about assuming that we’re ignoring you. I do get it. I hate to be ignored. My kids do it all the time when they’re mad at me for some consequence they have to accept for breaking rules. “I’m disengaging from this conversation,” says the 7-year-old, using our own words. It’s a messed up situation sometimes. It seems there’s nothing I can personally do that will eliminate the problem. Sometimes I try to avoid it by being extra attentive, but that creates another problem: you think I’m watching you too closely, and it wigs you out. I’m not a stalker, I promise. I’m just trying not to miss what you might say. I have had a habit of saying, when I realize someone had been talking to me, “Sorry. I’m deaf.” I don’t want to say this anymore, because I’m not sorry I’m deaf. I shouldn’t feel sorry if I miss something, because it’s really not anyone’s fault. This post is a simple request, and one that I hope you actually take the time to share with all your friends. It’s not at all the most important message I have to share, but it’s still one that I want people to get. If you don’t know us, stop assuming that we’re ignoring you. Instead, if someone doesn’t respond to you, please think: Perhaps the person doesn’t hear me. Perhaps the person isn’t deaf, but distracted, and you only need to say it again. Perhaps the person IS deaf, but doesn’t know you said anything. Get our attention and try again. If the person does turn out to be deaf, know that there are various methods, and what works for each person is different. Here’s a post I wrote about that: I can’t always lip-read you, and please stop shouting. You know what? If it turns out that the person really was ignoring you, then by all means, give him the evil eye. U’ve said it so eloquent! I get so frustrated when I’m at the check out, I look down in my purse to dig up my card and I look back up to see both cashier and the bagger are both making faces at each other like “how rude is this lady” (ME). Another subject when I tell a stranger, that I’m Deaf, they reply, “I’m sorry” I feel like saying, “It’s nobody fault”, but I just smile and move on. I’ve been a cashier and had someone come in and this exact thing has happened. But I’ve been involved with Deaf culture, so I always assume they’re deaf, and I know to wait patiently until they make eye contact. Honesty, I only get annoyed when the person finally looks up and I realize they’re not deaf, they’re just ignoring me. There’s always a few rotten apples, huh? Well-written article! I have been involved with the Deaf community for a LONG time & I’ve always said “I work with the “Hearing & Dumb”. Thanks for a great reminder for everyone!! Have wondered as a lare deafened adult that previously was actually socially agressive in that I loved being out among people and meeting strangers etc ,speaking on street corners ,elevators, and really getting to know the cashiers at the stores . Deeply involved in community services , music, etc ,,, suddenly at age 50 this scenario changed. Worked for years following that throughout the area and country with national association for the deaf and hard of hearing but now very truthfully I confess I am sorry I am deaf as it is so dif ficult to be out with friends and despite their efforts to keep me posted on their conversations and activities I used to be involved with , i can not actually have any idea of what is really being said and seldom go to the grocery store as try as I might , it is a super challenge to engage the bagger in a conversation that makes them feel important and a necessary part of my day ! Instead of music i have become active in the art community and find understanding as feelings and beauty around us is exchanged through brush and color or form on canvas . Still , even as art has so enhanced my life for these much later days , meaning no offense to the deaf community , as i have been so grateful to have witnessed so many outstanding leaders and just plain like us folks among that culture …. i can not help but miss what i used to know as one who could strike up a conversation with all others met on lifes path . Realizing I should not be regretting that loss of hearing and the fact even my husband has long ago just used the shouting system even cupping his hands to yell louder if I dont understand , I am sorry I am deaf , ! Today may just be a bad day as again honestly , usually I cope fairly well and present a positive attitude and outlook but needed I guess to express for a moment ,it is difficult for me at times and even believe it is ok to grieve occasionally for that part of the me that used to be , but then KEEP ON KEEPING ON ! Betty, thank you for the open sharing of your experience. I can understand completely. I think we have to, as a community, understand that everyone has different feelings and they don’t need to line up. You have a right to grieve. You have the right to have your sad days or sad moments and not be judged for it. I hope moments of happiness become more frequent. I do see how much more difficult it is to become deaf later in life. It’s one reason I urge people to learn ASL now before they ever lose any hearing. I don’t feel, personally, that how we feel about our being deaf must be like a light switch of positive and negative feelings. It can be a dimmer switch. We should give ourselves permission to have our rough times when things feel difficult. Betty W. I’m not deaf, but I have experienced a lot of loss in my life. Your grieving and that is not only ok, it’s necessary. so don’t feel guilty for your feelings. Also, a counselor to help you work through your grief can be a very positive thing. I believe that part of what you’re feeling is due to you having been a hearing person prior to the loss of your hearing. I am a recently retired Occupational Therapist, who had to retire due to my health …cancer ….I had a terrible time mourning my retirement!!! I cried and cried for weeks! You see, I was raised in the OT offices at the VA, and it was “part of me”. I have my moments,but, I have moved on,as now I have to help my mother,who is 93 years young,nearly blind from macula degeneration,and glacoma. And she’s lost most of her hearing as well…my best advice is to work in the arts,but, at the same time…help someone to “express” themselves through the arts….blessings on you! I know exactly how you feel, Betty because you sound so much like me! I’ve always been a chatter and friendly with everyone and had a huge circle of friends and acquaintances – in the old days. I went to meetings and church, etc., etc. loved symphonies and the theater. All of that has left me – little by little – as my hearing left me in chunks so now in my 60’s I can not follow along at church, can not go to the theater, can not keep up in conversations in public, barely one-to-one in a totally quiet environment. Can’t do the jobs I’ve always done – admin. assistant and waiting tables and customer service. And I have not been able to fill my life up with good things. I don’t have husband or kids so I’ve become like a recluse – some days I’m almost afraid to go out – people get really pissed and rude sometimes when you’re not hearing them! It is a loss – and I’m very grateful for facebook and acquaintances here – I’m glad I don’t have worse problems! I enjoyed your post, and reading the different comments. If you don’t mind I am going to relate my experience as a HOH person. I am 76 years young, and my hearing has been declining over the years, to the point that I am Deaf in my right ear and wear a Hearing Aid in my left, so my world is in between. I can, with the HA, hear most sounds, but the greatest challenge is understand the spoken word. Many times out of frustration, I have said I would rather have excellent hearing or be profound Deaf. It is a point of frustration for my wife, as she must repeat everything she says to me. I become somewhat withdrawn from society, having dinner with friends, going to a movie or just watching TV. My wife and I took a signing class, (Signed English), thinking it might help us in noisy surroundings. I hope you find new ways to connect with people so that you don’t withdraw completely. This is one reason I love online communication. Thanks for sharing your story! Great post. As a family with a Deaf daughter, we assume others are deaf all the time. My older daughter who works in a fast food restaurant was handed a sheet a paper with the order and started to sign with the customer, but he looked confused and pointed to the phone in his ear. Intent to communicate is everything, no matter how one does it! Thank you, and thanks for sharing that story! Fascinating how technology influences life. Thank you for this! I’m a teacher for students who are DHH and parent of an amazing young lady who has a severe-profound hearing loss. The situation with the police you described scares me so much as it could happen to any one of my students or even my daughter. Also, my daughter would be one to say, “Sorry” a LOT but now she is getting so much better at just advocating and telling the other person what she needs and what they need to do, which is awesome! I thank you for the friendly response! I wish I had stood up for myself when I was younger, so I think it’s great when kids start earlier. I became deaf over the course of about 3 months, 7 years ago. Not too long before that, I’d made a decision to finally go and learn ASL so I wound up becoming deaf as I was learning ASL and being taught by an amazing group of Deaf teachers who’ve become very good friends. Because of that, having proof right in front of me that d/Deaf is not less, it’s just different, I never had that urge to apologize for my deafness. I just don’t. I probably said 6 different times yesterday (ironically, while trying to meet with state vocational rehab people to try to get new hearing aids) “I didn’t understand you”, “please repeat that”, or “I’m deaf, can you please look at me” in the office. It really is so sad that people assume we’re being rude and ignoring others when we really just don’t know they’re talking to us. I can understand the worry over being polite, but there is something else to consider. Hearing people can be arrogant and they can be rude in their assumptions more than our attempts at being polite. You see, my husband is hearing and he states often enough that hearing people don’t always understand or hear each other because of the loud or busy world we live in. Too many distractions! On top of that, many of the hearing people are lazy in their speech (they mumble or talk too fast or too low). There are even those who hear just fine and have speech impediments! Imagine my shock at discovering this. Many are also too quick to fire into a temper over a seeming slight, in my own personal experience. It is the impatience of our generation that enters into these situations we deal with everyday. I have walked out in a parking lot and seen someone I recognized. When I call out to them, sometimes they hear me and sometimes they don’t. I always assume the wind might have snatched my voice away or my voice simply did not carry. Heck, maybe their ears are clogged from sinus. Maybe a very loud unmuffled car went by in the distance. I’m not upset by this — I move on. Hearing people, on the other hand, are quick to judge and be upset by it. Communication is a messy thing. It’s never simple or linear or clear, not for any group of people. Misunderstandings happen all the time. If they have this difficulty with each other, then why is the onus on us to do better in “not being rude”? Don’t get me wrong – I smile, I greet politely, I attempt to follow along and make sure I catch a line of questioning. I had to laugh at the part where you mentioned people being uncomfortable with intense stares. I try to balance that by staring more at my husband (who gives me cues and signs for me) than the other person, but when he isn’t around, I stare. I stare so hard! I try to let them know, but I don’t always. It’s good to know the cashier’s side of this, so thanks for sharing! I’m not totally deaf but over the years I have lost a lot of my ability to understand what is being said. My wife asked me if I felt I was rude by not being an active part of the conversation. I think I try to take part but with background noise and soft spoken people it’s hard. I had to retire early due to my hearing loss, being in the medical field I didn’t want to make a mistake. My friends do enjoy my weird replies because I miss heard them. I like people as a whole and would feel bad if they thought I was ignoring them, but I don’t want to go around wearing a sign either. I continue to keep doing the best I can and smile a lot.